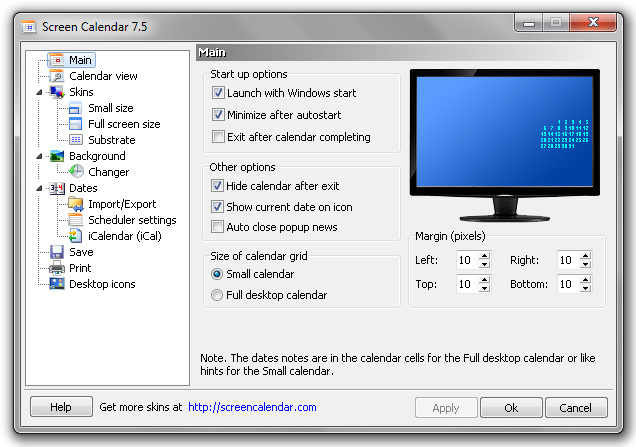 Screen Calendar for MS Outlook is a perfect desktop calendar for people who got used to planning in MS Outlook. Double-click on a date cell brings up MS Outlook Calendar where you can schedule your day. All records added to Outlook Calendar will be exported to the desktop calendar and updated automatically. Screen Calendar for MS Outlook schedule your time in your usual way and enjoy additional features like calendar skins and wallpaper manager. Perfect desktop calendar for people who got used to planning in MS Outlook. Wallpaper management - Manage and auto-change your wallpapers with a built-in wallpaper manager. Desktop icons management - Arrange and manage your desktop icons directly from the program menu. Print and Save options - Print or save current calendar, notes, or background image. Qweas is providing links to Promo Screen Calendar for MS Outlook as a courtesy, and makes no representations regarding Promo Screen Calendar or any other applications or any information related thereto. Any questions, complaints or claims regarding this application Promo Screen Calendar for MS Outlook must be directed to the appropriate software vendor. You may click the publisher link of Promo Screen Calendar on the top of this page to get more details about the vendor.